After a very long wait, the Mistress has arrived!! 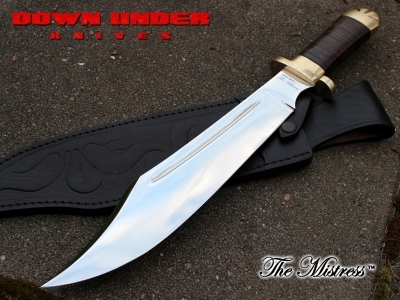 Here's one that Down Under Knives designers have been working on for quite a while. 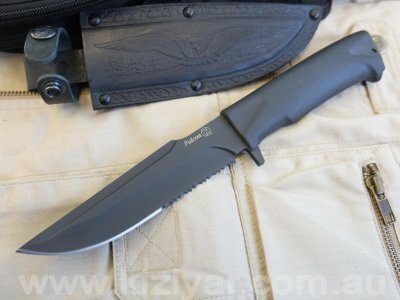 The mission was simple: push the limits and make the biggest, meanest blade that can still be reasonably called a knife, without compromising balance and usability in the slightest. 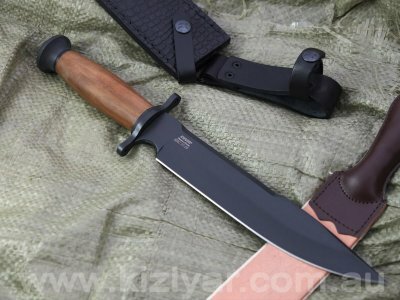 To accomplish this, we started with the dimensions and basic lines of a colossal vintage Bowie dating from around 1858 and started hammering out prototype after prototype until it looked and behaved exactly like we wanted it. 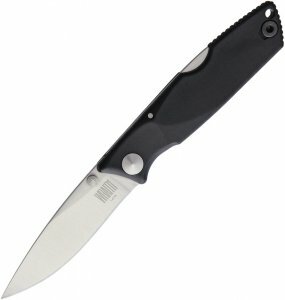 Not the easiest or fastest development process in the world, but with a knife this size you just can't slap something together in a CAD package and expect it to work. You have to feel it to know when you got it just right.